John Gierach must know something we don’t. If he has no shortage of good days, then he stands out among the majority of Americans today. I can’t wait to hear what he has to say in his continuing monologue of observations about fly fishing. Gierach simply isn’t for everybody, and I have found him a bit difficult at times, but all-in-all he’s a fly fishing writer who shouldn’t be passed up, especially in the desert that is new literature on fly fishing. 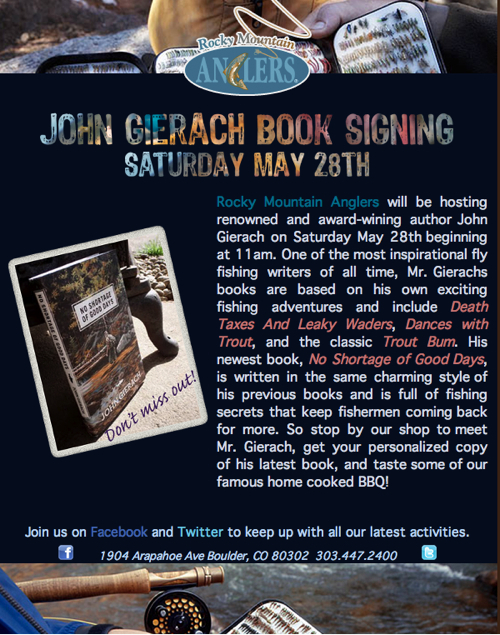 If you happen to be in the area of Rocky Mountain Anglers, the “nice fly shop” in Boulder Colorado, be sure to attend his book signing this Saturday, May 28th.